Charlie Chaplin made audiences laugh, but he also made us feel. His films often balanced delicately, as poet Lawrence Ferlinghetti observes, on “a fine line between sentiment and sentimentality.” Buster Keaton may not have elicited as much laughter or emotion as Chaplin, but his comedy was at least as creative – particularly throughout the 1920s when he took great risks both physically and financially. Harold Lloyd lacked the vaudeville training and natural comedy of Chaplin and Keaton, yet he could make us laugh as hard as we did when watching Chaplin, and could elicit as much sympathy and suspense as Keaton, but he had to work harder at being funny. And work he did, churning out more pictures over the course of his very prolific film career than Chaplin and Keaton combined. But, although Harold Lloyd rivaled Chaplin’s box office success and earnings, his place in film history is sometimes dismissed by critics and is overshadowed by the great talents of his two main comedy contemporaries. Today, Chaplin’s Tramp – with his tiny moustache, his wooden cane and his bowed legs – is probably the most iconic of the three figures. His image is painted all over Los Angeles and his old studio (later Jim Henson Studios) still stands on La Brea Avenue, while the studios of Keaton and Lloyd have disappeared and their film locations are now, a century later, hardly recognizable. The location of Lloyd’s studio is now – and has been since 1956 – the site of the Los Angeles California Temple of the Mormon Church. We remember Keaton today for his deadpan expression, earning him the nickname, “Old Stone Face.” Keaton rode the front of train engines (The General) and had houses collapse around him (Steamboat Bill, Jr.) and hardly blinked. The world around him might be in chaos, but his expression let us know that he was calm and collected in his resolve that everything would be fine, a result of his character’s determination combined with trust in the hands of fate. Harold Lloyd we remember today not for his “Lonesome Luke” character (a Chaplin knock-off) with which he started his career, but with his “Glasses Character.” Like Keaton on screen he faced insurmountable odds to achieve his goals, but unlike Keaton his face was exceptionally expressive. His comedy was physical like Chaplin’s, a combination of raw slapstick and animated emotion. His objectives on screen were like those of Keaton’s characters, with physical stunts equally impressive and often more suspenseful (though, of course, no one could equal Keaton’s use of special effects, as evident nowhere more so than in The General – a big budget film for its day – in which he collapses an entire bridge with a train on it). But, unlike the down-and-out tramp and Old Stone Face, Lloyd’s character was more of an everyman. Lloyd’s glasses, like Chaplin’s ill-fitted suit, firmly established his character. For Lloyd, the glasses make him seem common and they also challenge the general perception that men with glasses are more serious and astute, a perception that perhaps helps Lloyd elicit greater laughs. Lloyd’s character is anything but what his first appearance might have us believe. Instead of being an erudite and no-nonsense fellow, he is bumbling, clownish, playful and, despite being a common man, he is willing to take some very uncommon risks, from scaling buildings to chasing down robbers and murderers (The Kid Brother; Grandma’s Boy), making us laugh along the way. For the many unfamiliar with Lloyd’s comedic style, the image of him dangling from a clock in Safety Last! is perhaps etched in their consciousness even if they have never seen the film. This is probably, as Roger Ebert writes, “the most famous shot in silent comedy.” And it is probably one of the most iconic shots in film history at that, paid homage only a few years ago in Martin Scorsese’s visually stunning 2011 film, Hugo, an adaptation of Brian Selznick’s beautifully illustrated children’s book and tribute to early cinema, The Invention of Hugo Cabret. But although many are likely familiar with Lloyd’s image, few have – as Ebert writes – seen his works. Today, people are probably less familiar with Lloyd than with Keaton and certainly less familiar with Lloyd than they are with Chaplin. And there are several reasons for this. Comedy, as mentioned earlier, did not come as naturally to Lloyd as to Keaton and Chaplin. 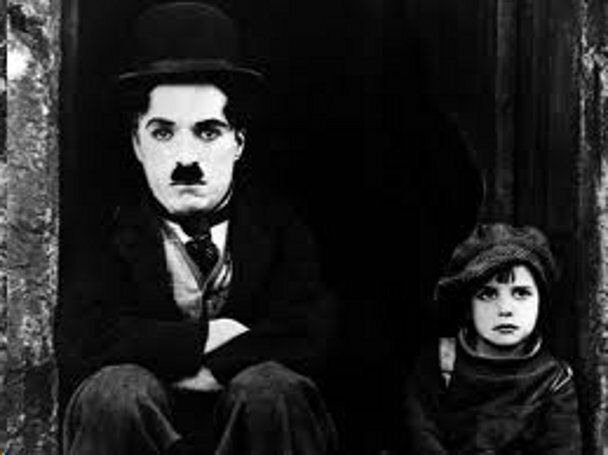 It took him time to perfect his character, moving away from being just another Chaplin imitator and establishing his own brand of silent comedy and then developing that character and giving him dimension. Once he did it he did it beautifully, and in high demand he cranked out films in rapid succession, amending them according to public tastes (using the preview to his advantage). The famed producer Hal Roach remarked of Lloyd’s lack of inborn comedic genius that Lloyd was the best actor to play a comedian, owed largely to the same sort of persistence that characterized his on-screen persona. Chaplin was the most recognizable figure in early cinema, but by the 1920s, Lloyd was giving him a run for his money, though working at least twice as hard, or more if judged by output alone—Lloyd cranked out 12 feature films in the 20s compared with Chaplin’s four. Yet over the years Chaplin’s iconic status remained constant, though teetering during the hyper-reactive McCarthy era. Keaton and Lloyd both successfully bridged the gap from silent films to talkies early on, but the stardom of both waned throughout the 1930s and 40s, becoming for many just one of those “dim figures you may still remember from the silent days,” as William Holden’s character famously says in Sunset Boulevard (a scene with a cameo from Buster Keaton). But unlike Lloyd, Keaton kept acting in films throughout his life (with memorable cameos in films such as Chaplin’s Limelight, Stanley Kramer’s It’s a Mad, Mad, Mad, Mad World and A Funny Thing Happened on the Way to the Forum), even if he didn’t actually have the creative control he once possessed, and in the late 1950s his films experienced a renewed interest, something Lloyd’s films would not enjoy for a few years. One argument for the eclipse of Lloyd – who has been referred to by film historian Kevin Brownlow as “the third genius” of silent comedy (along with Keaton and Chaplin) and by others as the “King of Daredevil Comedy” – is that though he produced many of his own films, he never took a directing or writing credit, as did the other two geniuses. Thus, he might be less respected as “just an actor.” Director credits in his films were given to the likes of Sam Taylor, Fred C. Newmeyer and Hal Roach. Yet Lloyd produced many of his films and it is very clear that Lloyd was at least as much involved with creating his films as his two contemporaries, possessing in the 1920s a great deal of creative control over his works (much more so than many directors today), and reworking scenes to perfection, again like both Keaton and Chaplin. It has also been argued that while Lloyd was extremely popular in the booming 1920s, with his go-getter attitude and his ability to beat the odds and get ahead (not unlike his own climb from being a film extra to being a top-earning star), by the 1930s the American public had little taste for pictures of this sort. With the market crash of 1929 and rapidly escalating unemployment, a grinning character who squeezed past all of the obstacles to success that stood in his way was not something that movie audiences craved when their own reality seemed so grim. The experiences of Chaplin’s hungry Tramp in the 1930s were more reflective of the typical everyman than Lloyd’s Glasses character. Though Keaton also played a go-getter, his success was often the result of fate as much as personal motivation, and in many films he wasn’t so much forging his way up and ahead, but was fighting to get back what was lost by either human force or nature. While Lloyd’s most memorable on-screen moment shows him dangling from a clock as he scales a skyscraper in order to prove himself, Keaton’s is of him just staying firmly put while the front of a house collapses over him, lucky enough to miss the blow simply by standing squarely in the middle of where the window frame lands. The end of Lloyd’s film career as an actor was marked by a disastrous collaboration with acclaimed director Preston Sturges. Though Sturges greatly admired Lloyd’s work, particularly the 1925 film The Freshman, creative differences between Sturges and Lloyd soon surfaced. While the film, The Sin of Harold Diddlebock, has been lauded by some critics, it was not a commercial success. Producer Howard Hughes pulled the film after its initial release in 1947. Some scenes were shot again and the film was re-edited and released in 1950 under the title Mad Wednesday, though faring no better with the general public. Although the film was nominated for some awards, including a Golden Globe nomination for Lloyd, it was the final nail in the coffin of Lloyd’s career as a film star. Another interesting theory for the decline of Lloyd’s mark (via the liner notes by Ed Park) comes courtesy of Orson Welles, who knew Lloyd through their shared affinity for magic. Says Welles: “Harold Lloyd—he’s surely the most underrated [comedian] of them all. 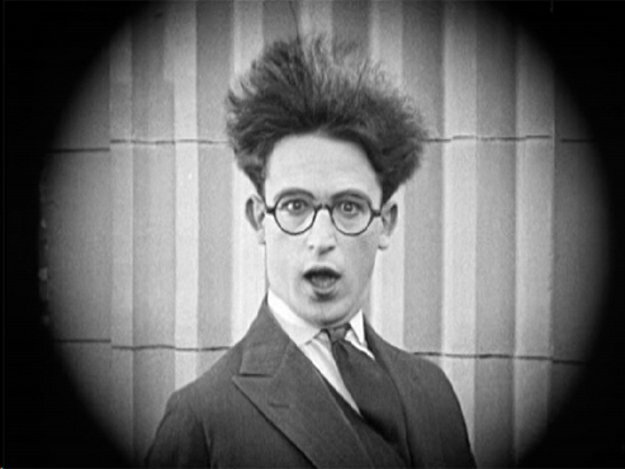 The intellectuals don’t like the Harold Lloyd character—that middle-class, middle-American, all-American college boy. There’s no obvious poetry to it.” But Park adds, “Yet it’s just this everyman persona that gives Lloyd his oomph” and he suggests that his poetry was more subtle than that of Chaplin and Keaton. And while Keaton is often praised today for his work (and rightfully so), he did occasionally borrow from Lloyd’s bag of tricks and both he and Chaplin greatly admired the style of many of Lloyd’s films, especially Grandma’s Boy, credited as the first feature-length film in which Lloyd successfully matches up comedic gags and slapstick with character development. With Grandma’s Boy, Lloyd’s Glasses character would acquire depth and would no longer be just a vehicle for driving laughs. A final explanation that has been presented for Lloyd’s fall from stardom (raised notably by Lloyd’s granddaughter, Suzanne) is that for many years he, unlike other contemporaries, resisted rereleasing his catalogue or selling his films for use on television, concerned with lack of control and the interference of commercials, which disrupt whatever it is that the filmmaker is trying to communicate to his audience. One can just imagine Lloyd fretting over his suspenseful climb up the 12-story Bolton Building from Safety Last! being interrupted by a commercial selling Maxwell House coffee or Carnation milk! Throughout the 1940s and 1950s audiences demanded talkies and many of the films of the silent era were neglected during this period, not to be revived until the late-‘50s (as was the case with Keaton’s body of work) and early 1960s (as with Lloyd’s oeuvre). In the ‘60s Lloyd released two compilations featuring scenes from his 1920s classics, which sparked some renewed interest in his film catalogue. In the 1990s his works were released on home video and a decade later on DVD, but, despite all of this, many today remain unfamiliar with Harold Lloyd’s spectacular world of comedy. No matter the true explanation for Lloyd’s relative obscurity – likely a combination of several, if not all, of the various factors discussed above – he still matters today. Though he may be the least known and appreciated of the three geniuses of the era of silent comedy, Harold Lloyd was a giant working among bigger giants and he worked harder than his peers if merely to keep pace with their inborn comedic talents. And through his determination, not unlike his character, he influenced and won the respect of those around him and audiences loved him, too. Impressively, Lloyd (like many in that period) did a great deal of his own stunts, sometimes foolishly. What makes this particularly remarkable in Lloyd’s case is that many of the stunts executed in films like Safety Last! were performed after he had lost his thumb and index finger on his right hand in 1919, when Lloyd posed for publicity photos using a real bomb that was mistaken for a prop. But Lloyd’s impact is bigger still for he not only did what others were already doing, but also pushed forward against the existing boundaries. In films like Grandma’s Boy Lloyd toyed with existing conventions of comedy. In The Kid Brother and Safety Last! he played with camera angles and to great effect. Lloyd’s films also created the templates that are still (over)used today for two popular genres. Safety Last!, Ed Park writes, is “the template for the contemporary action flick.” And others have credited Lloyd with developing the template for the modern romantic comedy. In addition, Lloyd influenced not only the work of Keaton, but of countless others, including Woody Allen (whose antics in Sleeper owe more to Lloyd than any other silent era comedian), Preston Sturges and Mike Nichols (the ending of The Graduate borrows greatly from Lloyd’s 1924 film, Girl Shy). Plus, the characters of the Farrelly brothers’ Dumb and Dumber were named after Harold Lloyd. From a historical standpoint, Lloyd’s films, many shot on location around Los Angeles, are also great pieces to study for any with an interest in the city’s urban metamorphosis over the years. And, above all, Harold Lloyd still matters because his films remain wildly entertaining and fresh, especially in the restored versions which have been released in the past decade. Harold Lloyd might not have had the poetic genius of Charlie Chaplin or the bravado of Buster Keaton. But that’s alright. He had, instead, the subtlety of Harold Lloyd and he created a character with depth, a character we could relate to through the ages, who shared our dreams to succeed and who could make us laugh just as well as he could make our hearts thump and our palms sweat. To some he is undoubtedly still one of those “dim figures . . . from the silent days,” but to those familiar with work, those who love film and film history, he is so much more: an innovator, a daredevil and a hard-working everyman whose contributions were immense, but who remains overshadowed by the other great pioneers of cinema. Benjamin Wright is a contributing writer at Highbrow Magazine.